Find links to imaging tutes at ImageMagick, blank shapes, my fantasy stories and bad poetry. Use online art to express yourself! But please, don't hotlink to my images! Thank you! Plus links to other great sites. 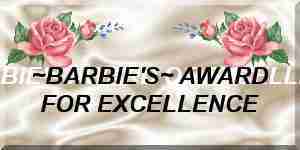 Here's an award I received from Barbie for helping out a fellow webby.. I feel that as I have received so much help from others..it's my duty and honor to help others. Check out Sally's place ... she just brought us another IM (thanks to ArborHosting for hosting it). IM means ImageMagick Links to some of the other online IMs can be found on my F-key page above. Who Is Hosting This .com offers many IM tutes as well.